Rehabilitation medicine is a very interesting and innovative specialty, which involves working with individuals with complex disability to improve their quality of life. The UK medical graduates spend 4 or 5 years in medical school before being awarded the MBChB (equivalent to MBBS). The graduated from the medical school enters into 2 years foundation programme (FY1 and FY2), which consists of six four monthly rotations in in various medical and surgical specialties including accidents and emergency and general practice. Entry into the foundation years is through an application. After finishing the foundation year training the graduates enter into core medical / surgical training (CT 1 and CT 2). During the core medical and surgical training they are expected to pass their receptive membership exams. Once they finish the core medical training and only after completing their membership exams they can apply for the specialty-training programme through national training schemes. The training programme starts at Speciality Trainee Level 1 (ST1) and consists of 4 to 7 years depending on the requirement of a particular speciality. Some specialties may have an exit exam that trainees are expected to pass before they finish their training and expected to apply for the consultant posts. UK graduates can join the rehabilitation medicine training programme after finishing their core medical training and completing the membership exam. 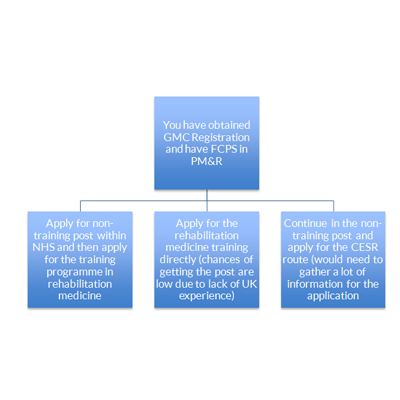 UK graduates who have completed their core training in medicine, surgery, psychiatry or general practice (MRCP, MRCS, MRCGP, MRCPsych) are eligible to apply for the specialist training in rehabilitation medicine through the national training scheme. Once they are successful in the specialist training selection process then a place on the training programmes is offered on the basis of candidate performance, choice and availability of the training post in a particular area. The training programme in rehabilitation medicine consists of 4 years of training in various aspects of the speciality with Work-place Based Assessment and Annual Review of Clinical Competencies (ARCP). Currently there is no exit exam for the speciality, however the trainees are expected and encouraged to appear and pass the European Board of Physical and Rehabilitation Medicine. The trainees who want to develop particular interest in various aspect of the speciality can take up fellowship posts ranging form 6 months to one year in duration. After finishing the training the trainees are awarded with Certificate of Completion of Training (CCT) in Rehabilitation Medicine by the General Medical Council (GMC) and their name is included in the specialist register by the GMC. 6 months before finings their training and depending on the successful ARCP the trainees become eligible to apply for the substantive consultant posts in the National Health System (NHS). 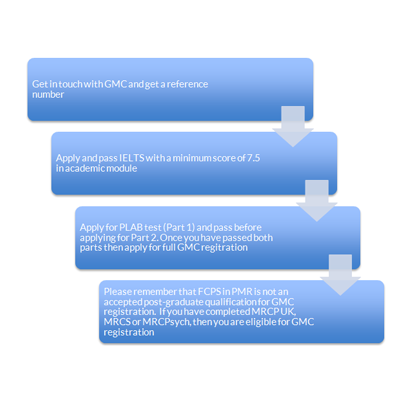 The first step in working within the United Kingdom for IMG in to obtain the GMC registration. IMG can apply for either provisional or full registration depending on the acceptable internship in their respective countries that is equivalent to foundation programmes in the UK. To apply for the GMC registration it is mandatory to show English Language Capability by achieving a minimum score in the academic version of the IELTS test. The test is conducted in various cities in Pakistan through the British Council. Once the IMG has passed the IELTS test then the GMC registration is through these three main routes. Sponsorship by an approved sponsor. British Society of Rehabilitation Medicine (BSRM) is the learned society for the rehabilitation medicine practitioners and there is a lot of information regarding the speciality and training on their website.